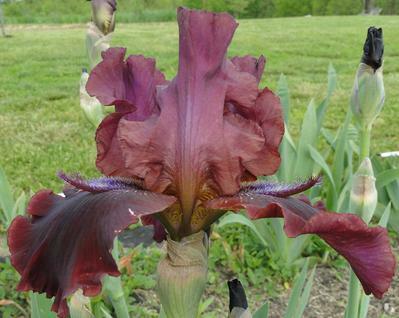 Wopanog Warrior-(Jim Hedgecock-2014)-Tall Bearded Iris-34 Inches Tall-Early Medium Bloom Season-Ruffled standards are wine red. Ruffled and fluted falls are darker winr red with slight 1/8" rims of medium red. Silvery blue white haft marks at beards. Maroon beards end in 1/2" blue horns. Slight mild fragrance. Both parents are rebloomers. Rebloom untested.